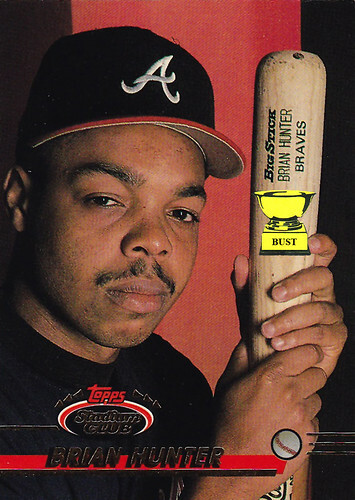 Brian Hunter's train of thought from 10:42 to 10:44 a.m. Feb. 7, 1992: "Man, I am so ready for this photo shoot. Let's see, tight black T-shirt: check. Tousled mustache: check. Suggestive stare: check. Bat that emphasizes my 'Big Stick': check. Oh yeah. All right, Mr. Photographer, make sure you zoom in on my wide-set eyes and my bat. Oops, almost had the writing on the bat turned the wrong way. Hold on, let me get it centered in the light ... yeah, there we go. I hope the ladies notice the 'Big Stick' part. Ladies buy baseball cards, right? I'm pretty sure. I know that, between my bedroom eyes, suggestive bat and perfectly round face, they'll be beating down my door once this photo hits the shelves."